Tilos is a secluded island in the Dodecanese Archipelago and is hardly known as a tourist destination. The limestone cliffs of Tilos mainly attract migratory birds and are therefore a magnet for ornithologists as well. In recent years, Tilos has become a peaceful centre for ecotourism. The Dodecanese Island is best explored on foot and this is also the best way to fully experience its quiet solitude. A holiday on Tilos means slowing down to arrive on a Greek Island that is little known and enjoy its fantastic scenery along with genuine Greek hospitality. The best way to get to Tilos is by ferry from Rhodes, other ferry connections are rather unreliable. Livadia on the east coast of Tilos is more popular with tourists than the island’s capital of Megalo Chorio. This is due to its spectacular position and the sandy beach that is almost two kilometres long. Situated in a fertile valley, the bay of Livadia is surrounded by undulating green hills. Most of the hotels and taverns of the island can be found here, and ‘Café Croma’ serves breakfast and dinner. It is managed by two Brits, and every Friday night is curry night. From Livadia, all interesting sights of the island of Tilos are easy to get to by coach or the only taxi on the island. 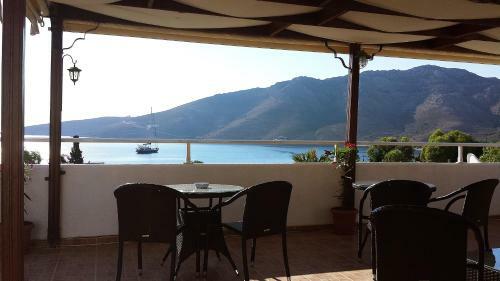 Tilos is an insider tip, and whoever has been there for a holiday becomes a regular. Megalo Chorio is the capital of Tilos, but as far as the tourist industry is concerned, it is eclipsed by the harbour town of Livadia. This is partly due to the fact that Megalo Chorio is about two miles away from the sea. Originally Tilos had the two villages of Megalo Chorio and Mikro Chorio; for fear of pirates, they were built at a safe distance from the coast. When there were no more pirates in the Dodecanese Archipelago, people started moving back to the coast, and Livadia was founded. Mikro Chorio gradually became a ghost village, until there was only one woman left who lived there all by herself until 1974. For those with a taste for spooky things, the ruins of Mikro Chorio can still be visited by tourists. Megalo Chorio has remained the administrative centre of Tilos, but is not really a touristy place. But even if you don’t plan to stay there, Megalo Chorio is worth a visit.